You may have a business where you want to give your customers an incentive to use an affiliate link when they purchase from your site. If you are using the Affiliate Plugin with the WP eStore plugin then there is a solution for that. 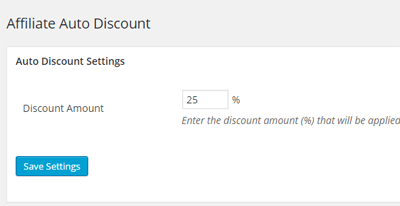 This addon will allow you to configure a discount percentage (example: 20%). When a customer (who was referred by an affiliate) adds item to the eStore cart to purchase, it will automatically apply the discount you configured. 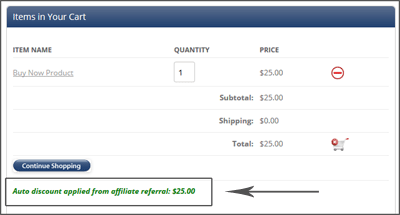 Step 1) Click on the “Auto Discount” menu link from the main Affiliate plugin’s admin menu. Step 2) Configure the discount percentage. This discount percentage will be applied to the eStore cart. Now, when a customer clicks on an affiliate link then comes to your site and adds item to the cart, he will receive the specified discount in his cart. Contact us to purchase this addon.